The first School of Medicine in Egypt was inaugurated in Feb.1827 following the decision of Mohammed Ali Pacha, Wali (Ruler) of Egypt to introduce the European techniques in the Egyptian army through the assistance of French officers ; he called Klute Bey from France in 1825 to be the first surgeon in the Egyptian army assisted by a number of physicians and pharmacists. The School and the hospital were annexed to a training camp at Abu Zaabal ( in the outskirts of Cairo ). It was joined by one hundred students from Al-Azhar (the oldest theological university ) under Klute Bey , the headmaster of the School during 1827-1837. 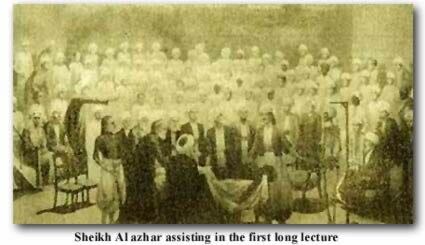 They studied seven subjects: chemistry/physics, anatomy, physiology, pathology, medicine, hygienics, and pharmacology; they were lectured by seven foreign physicians assisted by skillful interpreters. One of the prominent devotees, Dr.Essa Pacha Hamdi, father of the modern school of medicine was Director of the School of Medicine in the 80s of the 19th Century. He was forced to resign under the pressure of the British occupation which decided to transfer the studies from Arabic to English language. But Essa Pacha Hamdi, endorsed by the Minister of Education, could introduce modern techniques to the School and renovate its labs. And, back and deep into history, the famous historian Herodotus wrote that ancient Egyptians practiced medicine at an outstanding skill; nobody was allowed to practice just one specialized medical branch-one had to study all medical branches. Physicians in the pharaonic Era enjoyed a sacred status. There was special temples for delivery, and the mid-wives were called " The Gods Mothers ". The priests of the deity Sekht were famous in medicine. Her son Amhoteb was renowned in medicine to the extent that he was considered God. His father was the deity Betah. Amhotebs statue is now at the Museum of Berlin.